Why sentiment analysis is so hard? How to interpret the word “Crush” in a tweet? Crush as in “being in love” or Crush as in “I will crush you”? According to Albert Mehrabian communication model and statistics, I would say that on average a tweet for a sentimenter has an accuracy of 7%. No such a big deal, isn’t it? Let’s think about it by considering, as an example, the case of the sentiment analysis described in My issues with Big Data: Sentiment: crush as in “being in love” (positive) or crush as in “I will crush you” (negative)? What is a sentimenter? As a process, is a tool that from an input (tweets) produce an outupt like “the sentiment is positive” or “the sentiment is negative“. Many sentimenters are even supposed to estimate how much the mood is positive or negative: cool! Anyhow, according to Albert Mehrabian the information transmitted in a communication process is 7% verbal, 38% paraverbal (tone of the voice) and the remaining 55% is non-verbal communication (facial expressions, gestures, posture,..). In a Tweet, as well in a SMS or e-mail, neither paraverbal nor non-verbal communication are transmitted. Therefore, from a single tweet is possible to extract only the 7% of the information available: the text (verbal communication). So, what about the paraverbal and non verbal communication? During a real life conversation, they play a key role since they count for 93% of all the message. Moreover, since paraverbal and non verbal messages are strictly connected with emotions, they are exactly what we need: sentiments! Emotions are also transmitted and expressed though words such as “crush” in the example mentioned. However, within a communication process, not always the verbal and non-verbal are consistent. That’s the case when we talk with a friend, he\she saiys that everything is ok while we perceive, more or less consciously, something different from his\her tone or expressions. Thus we might ask: are you really sure that everything is ok? As a golden role, also for every day life, I would recommend to use non-verlbal signals as an opportunity to make questions rather than inferring mislead answers (see also: A good picture for Acceptance: feel the divergences & think how to deal with). For these reason, the non-verbal messages are a kind of noise that interferes with verbal communication. In a tweet, it is a noise that interferes with the text. Such a noise can be as much disturbing as much the transmitter and the receiver are sensitive to the non-verbal communication. It might be so much disturbing to change completely the meaning of the message received. From a statistic point of view the noise might be significantly reduced by collecting more samples. In Twitter, a tweet is one sample and each tweet have 7% of available information (text) and 93% of noise (non verbal communication) that is the unknown information. From a prediction\estimation point of view no noise means no errors. Thus, thanks to BigData, if the sentimenter analyzes all the tweets theoretically it’s possible to reduce the noise to zero and thus having no prediction error about sentiments…...WRONG!!! “the final error in our predictive models is likely to be irreducible beyond a certain threshold: this is the intrinsic sample variance“. The variance is an estimation of how much samples are different each others. In the case of a communication process, that means how much emotions are changeable through time. Just for fun, next time, try to talk to a friend by changing randomly your mood happy, sad, angry,..and see what happen with him\her (just in case, before fighting tell him\her that is part of an experiment that you’ve read in this post). In Twitter, the variance of the samples is an estimation about how much differently emotions are impacting the use of certain words in a tweet, from person to person at a specific time. Or, similarly, by considering one person, how much emotions are impacting the use of words differently through time. 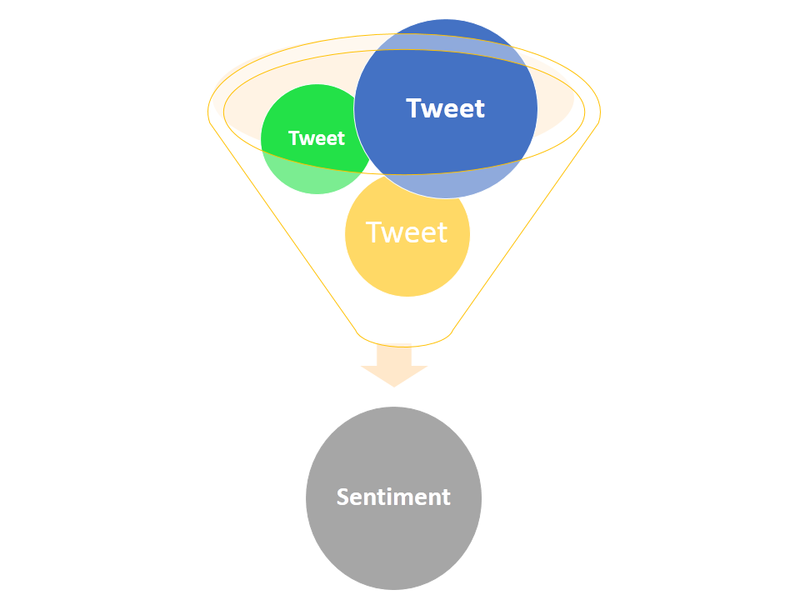 Like in a funnel (see picture), the sentimenter can eliminate the noise and thus reduce the size of the tweet bubbles (the higher the bubble the higher the noise) till a fixed limit that depends on the quality of the sample: its variance. …with the assumption that both samples and algorithm used by the sentimenter are not slanted\biased. If this is not the case, the sentiment bigdata bubble might be even larger and the prediction less reliable. Anyhow, that is another story, another issue for BigData sentimenters (coming soon, here in this blog. Stay tuned! ).